Pictured from left to right: Brighton Sawyer, Dirk Sawyer, and Byron Grant. 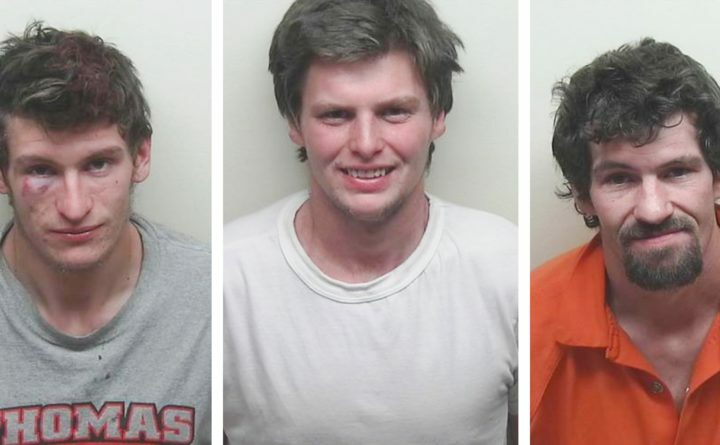 The three men who were arrested Sunday after running away from police and into an Ellsworth hospital were intent on visiting their ailing grandmother, according to a lawyer and family members. Police took the three men, all brothers, into custody in their grandmother’s room at Northern Light Maine Coast Hospital, family members said. “These gentlemen were going to the hospital to visit their grandmother who is very, very ill,” attorney Robert Van Horn, who was advising the men for the purposes of Tuesday’s bail hearing, told Justice Robert Murray. Byron L. Grant, 35, of Columbia; Dirk W. Sawyer, 22, of Columbia; and Brighton C. Sawyer, 21, of Norridgewock remained at the Hancock County Jail on Tuesday. The Sunday incident began around 1:40 p.m. when the men were riding in a pickup truck in Ellsworth and one of them “motioned the threat of a weapon” at a person in another vehicle behind the truck, according to Ellsworth police. Police were notified and then located the truck on East Main Street. The truck pulled over, but the men got out and ignored Officer Steve Mahon’s commands to stop, according to Ellsworth police. After seeing police in pursuit, they ran to the hospital, which had been placed on lockdown in an attempt to keep the men from getting inside. Each is facing a felony burglary charge and misdemeanor charges of assault, terrorizing, refusing to submit to arrest, criminal mischief, failure to stop for an officer and disorderly conduct. Matt Foster, Hancock County district attorney, told the judge that after the men were taken into custody, police did not find a gun on any of them or in their truck. Van Horn questioned whether the charge of burglary was justified, saying that the men were allowed into the hospital by someone else and that there was no evidence they were planning to commit a crime once they were inside. The men were unaware that the hospital had been placed on lockdown. Murray ruled that there was probable cause for the burglary charge because the hospital had been put on lockdown and the person who let them in was not authorized to do so. Outside the courtroom the mother of the three men, Heidi Grant of Skowhegan, said Tuesday that she is the one who let them in the hospital. Her mother has been ill for several weeks and, after doctors said her mother had taken a turn for the worse, she started calling family to tell them they should visit her mother. She said her sons called her cell phone from outside the hospital, with police closing in, to tell they were locked out and needed to get inside. She said she let them in the main entrance, which is always locked on Sundays, by walking out the door as her sons ran in past her. The police then detained her, she said. “Their only concern was to get to the hospital to see their dying grandmother,” Heidi Grant said. She said her sons ran out of gas as they got near the hospital, which is why they left the truck by the side of the road. She said they should not have run from police but that the police response was unjustified and made the situation worse. Her family already was under strain from her mother’s failing health. Ellsworth police were not available to comment on the incident Tuesday afternoon. Murray set bail at $1,000 cash or $10,000 surety for Byron Grant, who has a misdemeanor criminal history that dates back to the early 2000s. Dirk Sawyer and Brighton Sawyer, who have little to no criminal history, each had his bail set at $500 cash or $10,000 surety. If the men make bail, their bail conditions will prohibit them from having contact with each other or with the Ellsworth hospital. Each of the men is scheduled to appear back in court for a dispositional conference March 21.